This rare "Sundial" conversion Splitscreen Campervan originates from Oregon USA. Her charming appeal is the garden theme inside (including lawn!) which can easily be dressed to suit your wedding theme. The pastel green and cream paintwork blends with a wide range of colours and the pop out front windows are perfect for framing traditional, quirky, and romantic photos. 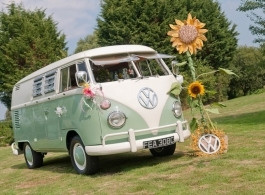 Also available to hire alongside her are a 1967 Splitscreen Campervan (code 0047) or a choice of 2 classic VW Beetles which you can see in the photos.